Thursday May 14th 1889 I had Frank helping me this forenoon. he helped with the cellar all forenoon and Adda and I finished it in the afternoon and I done some work in the summer kitchen. Frank planted for Will part of the afternoon and they finished about four oclock, he then finished the hen house and fixed the steps at the fort of the hill. The girls and Ott were over in the evening for milk and Mrs Hart called. Will went to town. I was very tired indeed. Wednesday May 15th 1889 Frank was working again today. he made me a new flower bed and moved the old ones. I was cleaning the summer kitchen in the afternoon. I was busy about the house most of the forenoon. weather very sultry in the afternoon. [the following text is written vertically in the right margin of the above entry] I had a berry patch fixed in the forenoon. Thursday May 16th 1889 We washed this forenoon and in the afternoon I did up the dinner work and Adda finished the summer kitchen. I made a jar of yeast in the afternoon. Frank came all day and cut up the tree from the front door and got sod to put down where he took up the flower beds. Will was fixing fence in the afternoon. he went to town in the evening. Friday May 17th 1889 It was steady rainy day. I done some baking, helped iron and wrote a letter to Mother before noon. In the afternoon I swept and cleaned my room and both parlors. About four oclock I went out and put my little chickens in out of the rain. I read in the evening. Went to bed early. Saturday May 18th 1889 I was working with the chickens in the morning and had a little time to work on the net. I washed the dishes after dinner while Adda did some other work. The girls were over in the afternoon and Bird Harris was with them. I finished the net in the evening. The incubater began hatching today. 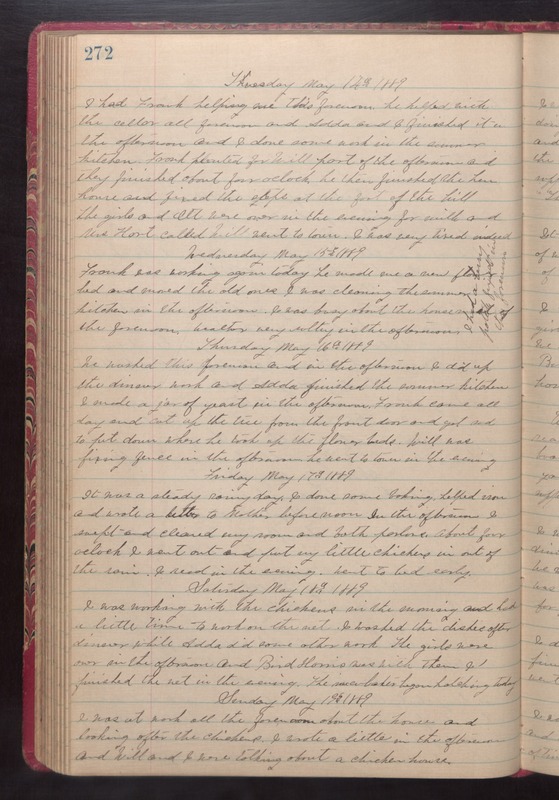 Sunday May 19th 1889 I was at work all the forenoon about the house and looking after the chickens. I wrote a little in the afternoon and Will and I were talking about a chicken house.